THE MAGIC OF THE ESTATE The first known documentation of rum production at the Appleton Estate is dated 1749, however the origin of the Estate dates back to 1655 when the English captured Jamaica from the Spaniards. During the English empire, when rum was transported back in barrels, it was discovered that the time spent in the barrel combined with the gentle rocking of the ship allowed for a smoother, tastier rum. During the Second World War, whisky was in short supply and experiments were carried out at the Appleton Estate to produce a type of rum that would serve as a substitute. Different rums from assorted barrels of varying age and type were blended together and the result was "Appleton Estate Special Rum." 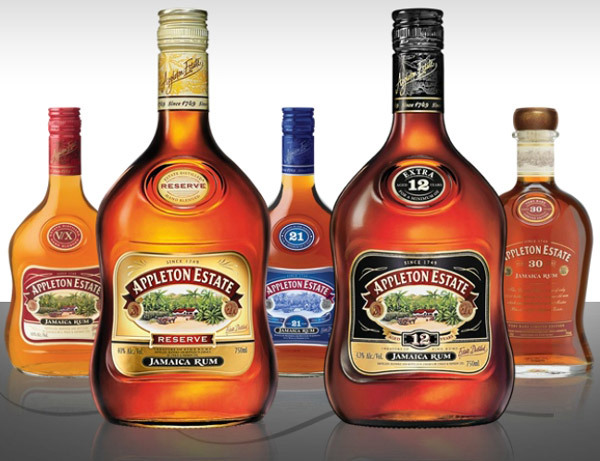 Appleton Rum was much smoother, lighter and more fragrant than other available rums and proved to be extremely popular. Appleton Rum became known as Bend Down or Ben Down. Back then it was illegal to sell rum of a certain proof in ordinary bars and shops and Appleton Rum was only sold in private clubs. But Appleton was so preferred by patrons they sold it anyway. It was not displayed, but kept under the counter. As it was not wise to ask loudly for Appleton Rum in the bar, the customer would whisper that he wanted a drink of Bend Down. Historical information of the Appleton Estate and demonstrations. Rum tasting in the Appleton Lounge.